Thank you to Natalie McKee over at Leaping Cats for this lovely guest post!! I am so excited to share with you her handmade creation. We met through the Ultimate Blog Challenge, one of my best blogging experiences so far. I hope you like her post! 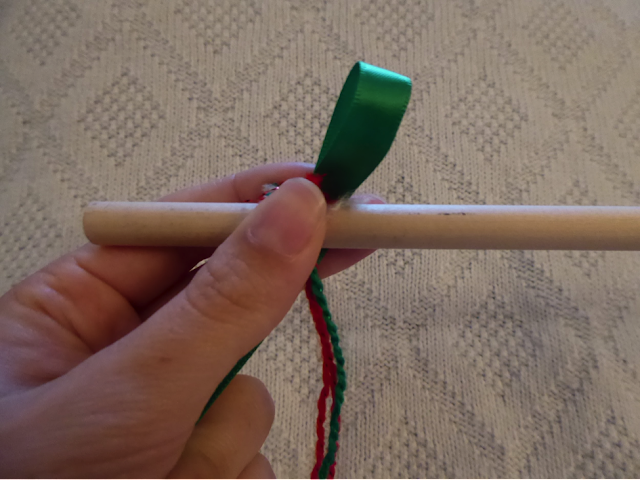 Cats are natural predators, but instead of stalking fabric mice or birds, this diy cat toy has them catching Christmas spirit! I know, pretty corny -- but really -- if you were looking for an easy Christmas craft, look no further. This “fishing pole” cat toy requires little more than ribbon and yarn, but will bring the magic of the holidays to your feline family members. First things first, you’re going to want to make your pom poms. There are a number of methods for doing so, but I personally like using either my fingers or a kitchen fork to make the different sizes. The method for creating the pom poms is the same whether you use a fork or your fingers, simply replace the fork tines with two, three (even four!) of your fingers in the steps below. 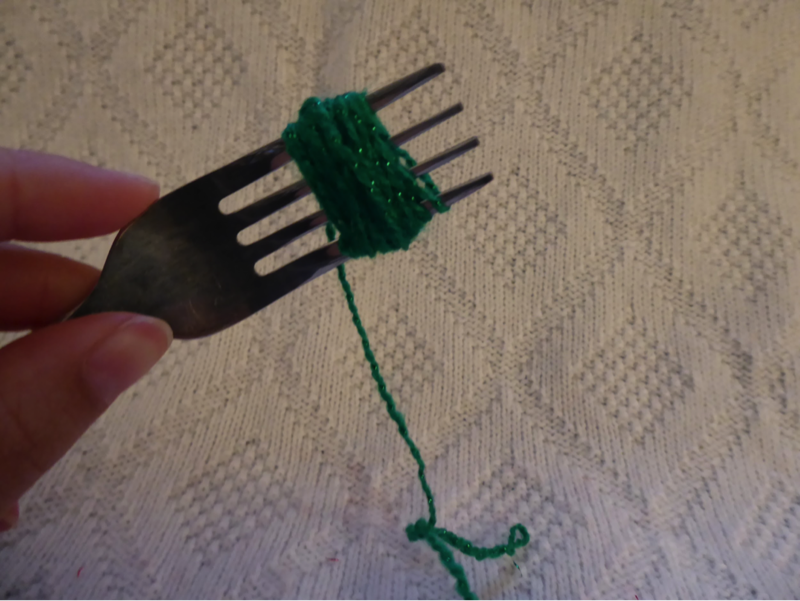 Take the end of your yarn and tuck it between two tines in the fork. 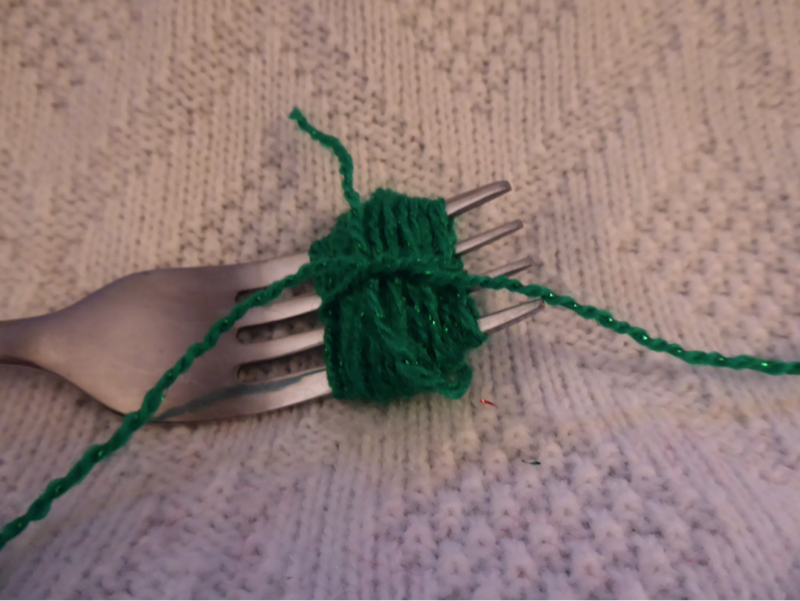 Next, start wrapping the yarn around the fork over and over until you have a big bunch gathered up. 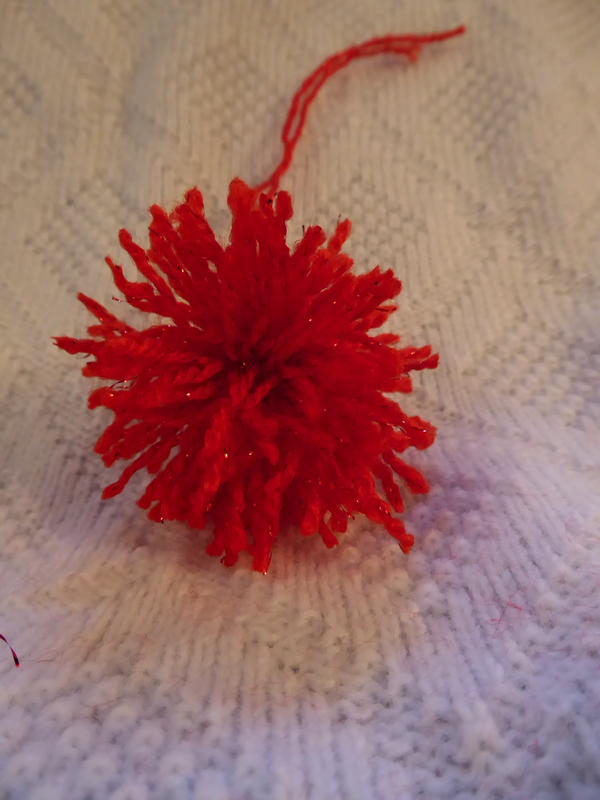 The more yarn you use, the puffier the pom pom (and what’s better than a puffy pom pom?). Next, cut the yarn connecting the fork to the spool, and then, cut a piece of yarn that’s about 5 to 6 inches long. 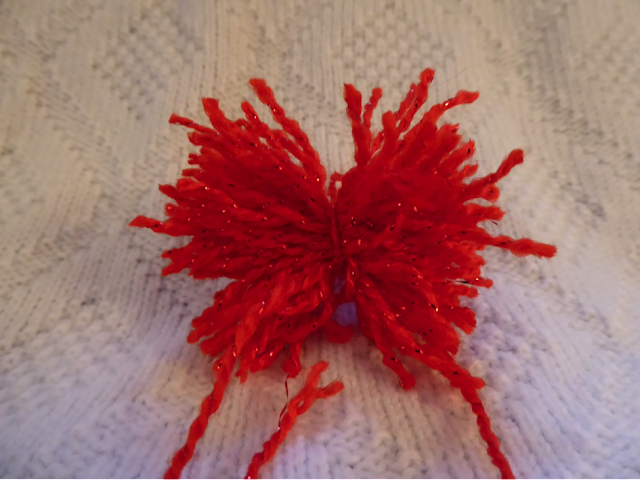 You are going to use this piece to tie off the pom pom. 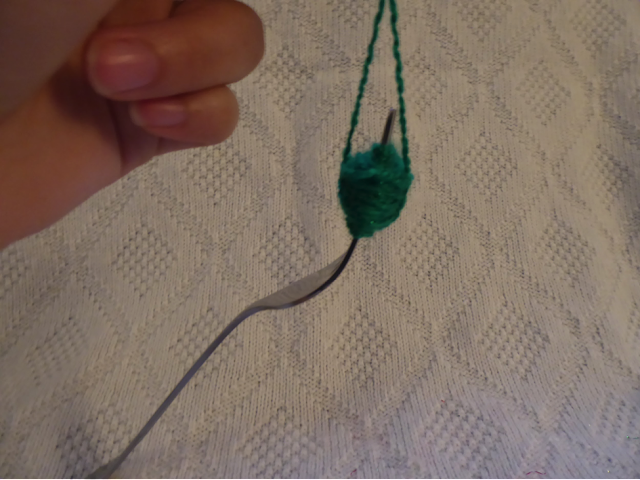 Now, slide one end of the yarn piece through the tines of the fork and gather it in a loop above the fork. 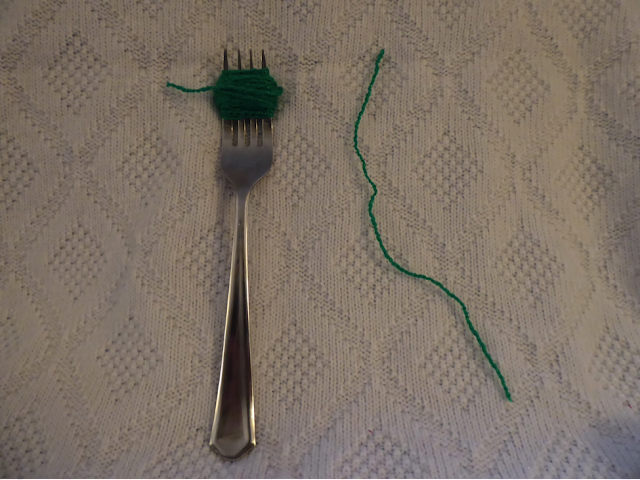 Loosely tie that yarn around the yarn bundle, and then carefully slip the yarn bundle off the fork onto a flat working surface. Tie the knot very tightly, and double knot. 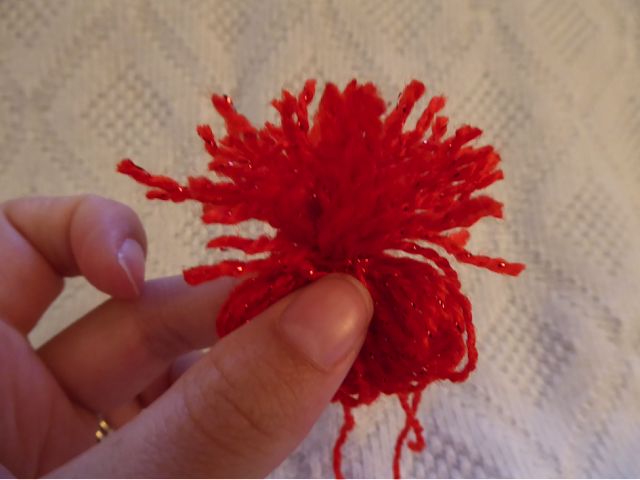 You are creating the “heart” of the pom pom, and if it’s too loose the pieces will fall out once you are finished (I learned this the hard way…). I recommend tying and knotting once, and then doing it twice for good measure. Remember: Your cat is going to be batting this to pieces, and you’d like it to last longer than a few hours, ideally. When you are done, you’ll have something akin to a bad hair day. You’ll need to carefully trim around the pom pom like you’re trimming a shrub to get a round shape. Note: The chubbier the yarn you use, the puffier the pom pom. 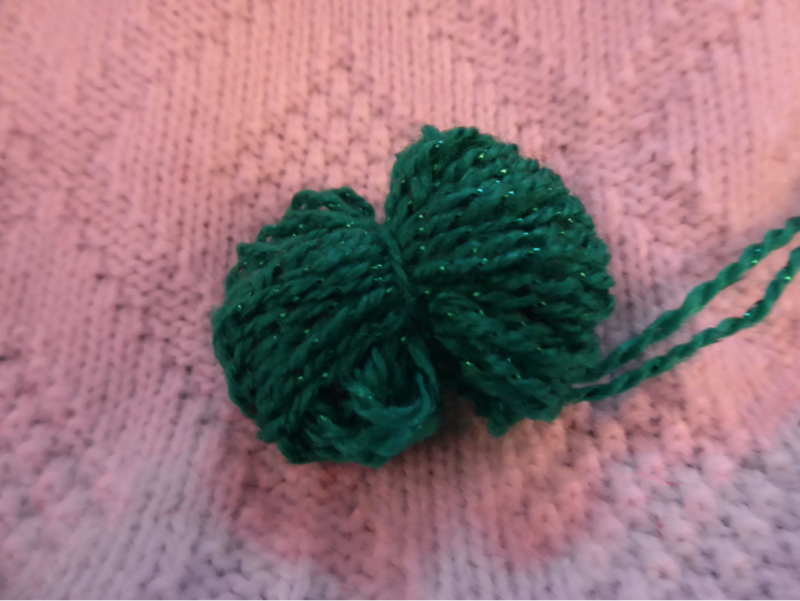 The yarn I chose was definitely on the thinner side, and looked best in smaller pom poms made with the fork, rather than the larger one (pictured above) made by wrapping the yarn around three fingers. 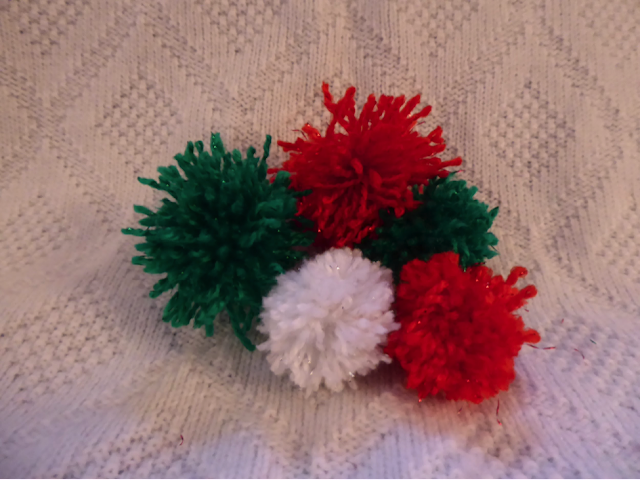 I made a total of five pom poms, but only ended up using my three favorites for the toy. 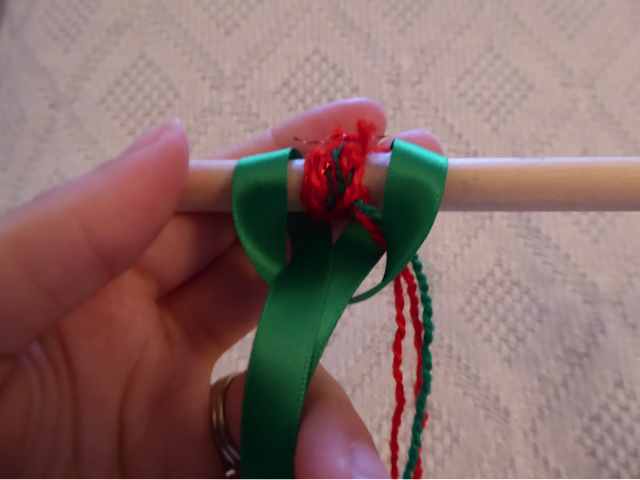 Next up, I tied a longer piece of yarn to each pom pom and then tied the yarn to the dowel. Double knot, again, for good measure. You can use a dab of hot glue here to hold the yarn (on the dowel) in place. 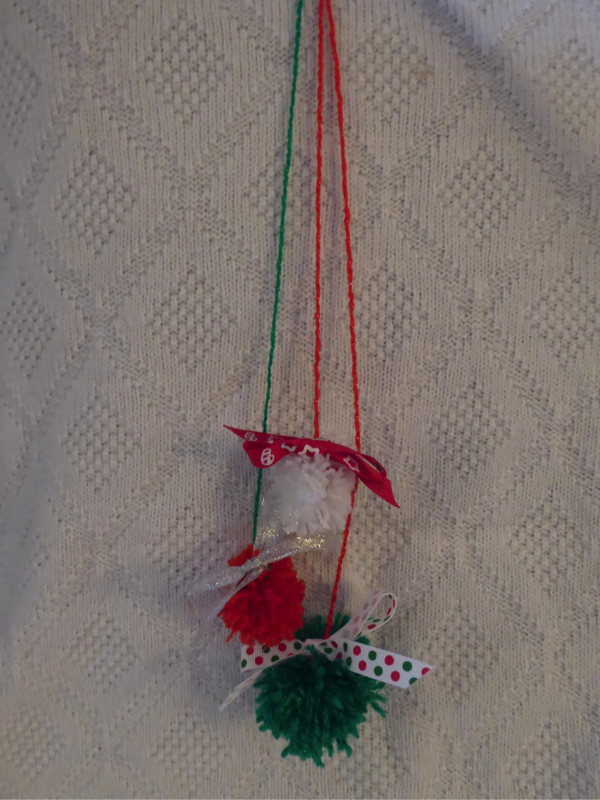 I offset each pom pom, so they hung at different lengths. 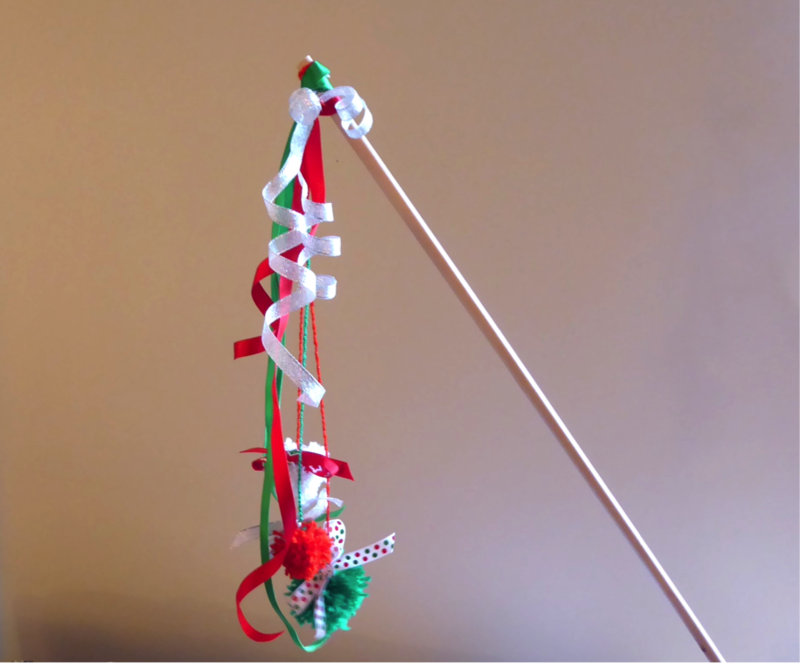 You can make them hang as low as you’d like, but the lowest pom pom on mine hangs about 12 or 14 inches from the dowel. 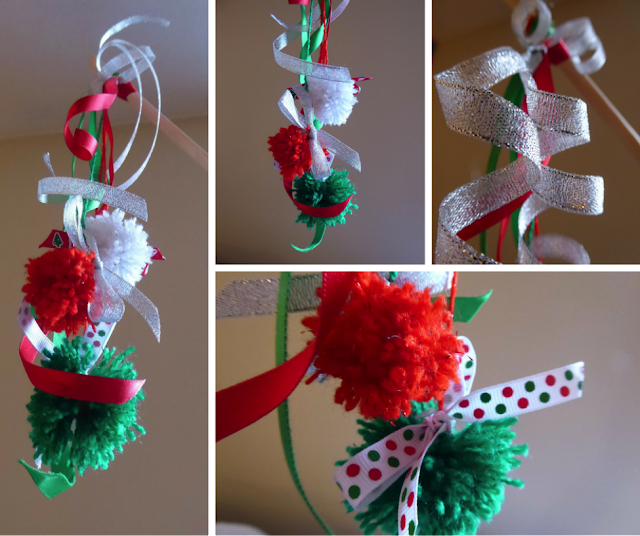 I then cut the ribbon into 10-inch pieces and tied bows onto the hanging yarn at the top of each pom pom. 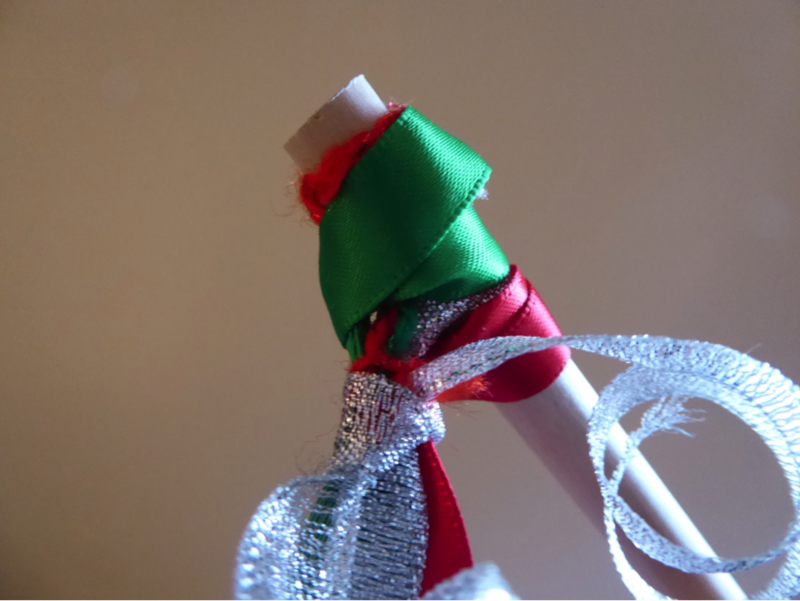 I cut the excess ribbon ends to keep each bow proportional. 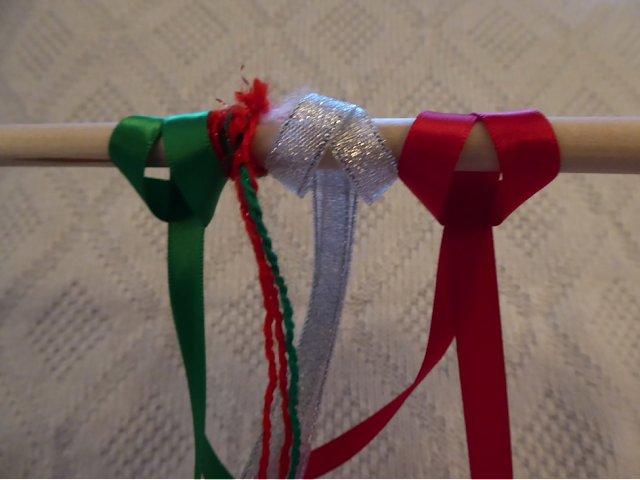 In order to hide the yarn on the dowel and to keep all the ribbons together, I pushed the knots on the dowel close together and then tied another piece of yarn around all the hanging yarn/ribbon pieces and knotted it, covering the yarn knot with another ribbon knot. Finally, I used scissors to curl the pieces of ribbon (not because the cat cares, but because it made it pretty!). The finished product? Pretty magical! You could always buy some catnip spray and spritz a little onto each pom pom to make this new toy even more enticing. Simply hold it over your cat’s head and see what happens -- it might even distract him from climbing the Christmas tree. Natalie McKee rescued her family’s cat, Pumpkin, from living as a stray when he was just a kitten. A decade later she writes at Leaping Cats about ways to keep your indoor cat fit, healthy and happy. Do you like what you see? Leave Natalie a comment here or on her blog to let her know!